Robert Brooks is New World Encyclopedia's Managing editor. Mr. Brooks earned a B.A. in Journalism from the University of Arizona (1980). After five years in community journalism working in a variety of capacities on weekly publications and briefly in desktop publishing computer sales, he came to Professors World Peace Academy as project editor. He devoted five years, from 1987 until 1992, developing book publications in New York City for the International Cultural Foundation and International Religious Foundation. While with ICF and IRF, Mr. Brooks was the publication designer and project leader for all aspects of print production. Under his direction, more than forty books for Professors World Peace Academy, International Conference on the Unity of the Sciences, New Era Books, as well as PWPA and ICUS journals and attendant promotion material for ICF and IRF conferences were brought into existence. 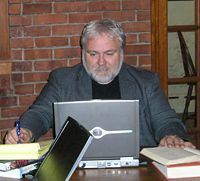 The culminating projects of his tenure as ICF and IRF Publications Director was the design, production, and packaging of World Scripture: An Anthology of Sacred Texts (1991) and the first three books in the PWPA Liberal Democratic Societies Series (1992). Mr. Brooks has won awards from the Rocky Mountain Collegiate Press Association for sports photography and photo essays. In 1987 he was recognized by Compaq Computer Corporation for outstanding sales achievement. This page was last modified on 6 June 2009, at 11:51.